The wedding preparations for Bollywood diva Sonam Kapoor and her rumoured entrepreneur beau Anand Ahuja are in full swing. Pre-wedding preparation has already started at Anil Kapoor’s residence and we are assuming it to be sangeet preparations. We also spotted several Bollywood celebrities arriving at Kapoor’s residence. 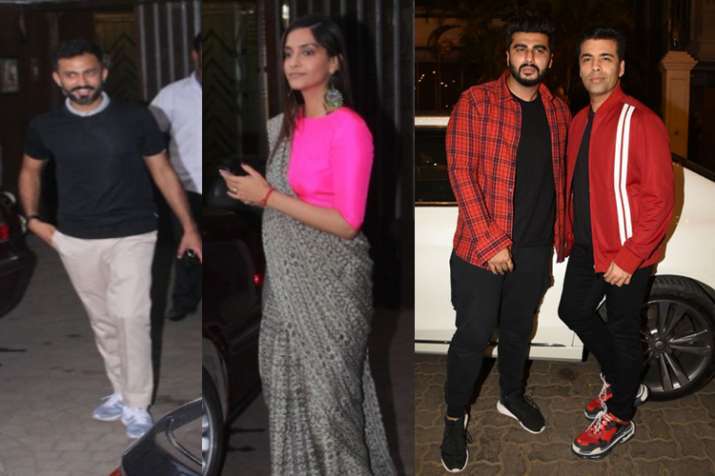 Filmmaker Karan Johar, Sonam’s cousin Arjun Kapoor, Jacqueline Fernandez and others were snapped entering Kapoor’s residence for the pre-wedding function. Along with Arjun Kapoor, number of kids were also spotted outside Kapoor’s residence. Arjun was also seen taking selfie with the group of kids. Sonam’s uncle Sanjay Kapoor along with his wife also visited Anil’s residence. He was looking all excited and was also seen showing his dance moves to the shutterbugs outside his brother’s house. His dance moves made us to assume that he might be gearing up for Sonam’s sangeet ceremony. As per the sources, Karan will be performing on the title track of Prem Ratan Dhan Payo in Sonam’s sangeet ceremony. Meanwhile, actor Ranveer Singh, Arjun and Sonam’s cousin Janhvi Kapoor will also be performing during the sangeet function. Jacqueline Fernandez will also be seen tapping her toes at the sangeet function, revealed a source. Sonam and Anand’s wedding date is May 8 and several pics from Anil Kapoor’s residence dropped on the online platform earlier, in which his house is seen all decked up. Bollywood bigwigs including Kunal Rawal, Farah Khan with her kids, fashion designer Masaba Gupta were spotted earlier at Anil’s residence earlier.